Meetic is a European dating network, and their Italian site is called, Meetic IT. Meetic sites are available in several different languages, and share the same layout and features. Members can also access any of the sites serving other countries. Subscription costs begin at €29.90 per month. Meetic.it is for Italian singles looking for a romantic match as well as anyone who'd like to meet someone of Italian descent. While Meetic.it is predominantly in Italian, accessing the site in English (or a number of other languages) is possible by navigating to the country specific site for that language. You can browse profiles for free on Meetic.it. However, you must pay a monthly, quarterly or yearly subscription fee to access email and chat privileges. Once you join as a free members you can use search options to locate potential matches in Italy or anywhere in the world. One thing to note about Meetic is that your profile will not just be visible in the Italian site, but also across the whole Meetic network - unless you specifically opt out. While this does result in a larger pool of potential matches it does also mean that singles you meet could be from anywhere in the world. This can get quite confusing because Meetic does have a lot of different websites specifically created for certain countries or region. After using advanced search options and bookmarking favorite profiles, you can use the site's Icebreaker feature to make that first step at communicating with a compatible profile. 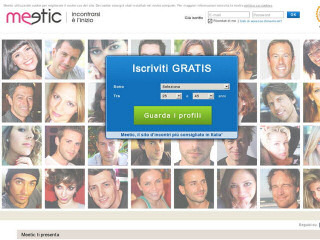 Meetic.it offers the chance for international online dating as much of the site's database consists of members from Italy and other European countries. You can modify your profile at any time you want and if you opt to pay the subscription fee are also given the benefit of a completely ad-free site. Rss Feeds. Subscribe to comments for this site. [?] Receive updates about Meetic.it directly through your newsreader. Meetic.it 4 1 A review of Meetic.it - Italy. Meetic is a European dating network, and their Italian site is called, Meetic IT. Meetic sites are available in several different languages, and share the same layout and features.